Northern Limit Line explains through vivid tales of brotherhood the story of South Korean Battleship 357 having a detrimental attack by the North Koreans. The well-developed characters also revolve around the 2002 FIFA World Cup in which South Korea played against Turkey. This was definitely a nose-dive into an impeccable drama. The mirror images that bounce off the screen of the World Cup and the almost dead survivors of the attack stun the audience with their contrast. One is faced with the gruesome casualties these real men endured while fans crowded the football stadium. 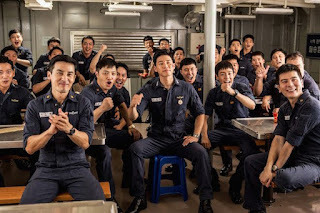 The lead character, Park Dong Hyuk, and his shipmates share food together, sleep in very close quarters, and share the final climatic battle caring for the other human being. The first drill portrayed on screen occurs right after a win for the national soccer team and has the men speed crazily to get in position. Scenes like that gripped the fast and orderly reality of the military fascinatingly. Park is told within hours of stepping on to the ship that one shot from the North Korean artillery bridge will sink their ship immediately. This almost gears up the audience with anxiety for the last 30 or so minutes of the intense drama. The unity of the group on the ship comes with the jokes that the men use with one another. One scene when the men are discovered eating noodles, the commander makes them do 100 paused pushups. Instead of saying 1 and 2 for each pause in the exercise, the men yell food terms of what they just ate. These moments are so sorely missed during and after when the tragedy takes place. I have to say that this picture made me know each character like they were really in my life. Like I said before, the character development was so detailed that it basically created the Facebook page in my mind for the main men in the film. One of Park’s friends, CPO Han, deals with tremors in his right hand which makes his job as a steer even more demanding. A brief and close encounter with the North Koreans early in the film puts CPO Han in the film goers eyes more closely. This character who is based on a real person is very relatable to somebody who is put before a painful obstacle. Director Kim Hak-soon draws love for these men with a supremely executed war drama.